The Brunswick Cutting Edge bowling balls continue the Edge series of bowling balls featuring a low RG symmetric weight block. The Cutting Edge Hybrid combines this core with their Relativity Hook Hybrid coverstock. This pairing produces excellent traction in the middle of the lane as well as powerful continuation down the lane. The #CuttingEdge isn't just about FLIP. Check out Lane Side Reviews as they take the #CuttingEdgeHybrid to the lanes and see just how much #HOOK this ball delivers! The Cutting Edge Hybrid is one of the strongest balls in the Brunswick line. It is definitely the strongest at its price point. It offers a reaction that is clean through the front with a strong read of the midlane. In my opinion it is very smooth and predictable. I am going to use this ball when the Cutting Edge Solid and the Method are going too long. The Cutting Edge Hybrid will be the first ball out of my bag on most medium and longer sport conditions and on most house conditions. This ball is perfect for figuring out how long the pattern is and what reaction shape will work best. Overall the Cutting Edge Hybrid is a stronger benchmark type ball that offers a lot of hook for the money. It is a very versatile ball and will work for may styles where oil is present. Well, if you are going to take the Cutting Edge Solid with you every time you bowl then you might as well bring along the Cutting Edge Hybrid. This ball gives me a few extra boards down lane when there is more volume or a longer pattern. The Hybrid and Cutting Edge Solid are a great pair. It’s the combination of the original Edge and Melee Jab which simply means it’s a great ball and one which will help you especially if you don’t have a high rev rate. The Cutting Edge Hybrid is one of my favorite hybrid ball I have put in my hands. Ball is very predictable and reads the Midlane quick and has a strong flip backend motion in the backend. The Cutting Edge Hybrid and Cutting Edge Solid is a great 1-2 punch for anyones arsenal. The Cutting Edge hybrid is one of the most versatile, all-purpose balls I've used in the Brunswick line in a long time. East surface prep combined with the hybrid coverstock and symmetrical core allows for a variety of styles to use this ball as a benchmark, or when a controllable but powerful reaction is needed. Mine is drilled 55 x 5 x 65 with the pin under the middle finger. For me this layout creates miss area inside of target and gets the ball rolling nicely through the midlane. It's a terrific ball at an affordable price point. Worth it for every serious or league bowler to try. Punched up my Cutting Edge Hybrid 40x4.5x35 (pin over ring) with the intention of having something safe rolling to stay a little straighter than my Method. On the lanes, I saw the even, arcy shape that I had expected, but the Cutting Edge Hybrid turned out to be WAY more ball than I had bargained for. The strong shell and dull surface prep have this ball handling much more oil than anything I expected to see at this price point. Its rare to see a lower end ball with a dull cover to begin with nowadays, let alone something so porous. That strong cover matched with the low rg melee shaped core gives me a surprising amount of traction and early revs, crossing an average amount of boards and a very controllable smooth roll on the backend. My first experience with this ball was on a slick 44' Big Ben house pattern. My feet were aligned the same as they were with the Quantum Bias and I was still getting the ball to roll up into the pocket albeit with an earlier read and less response off the backend. I stuck with the Cutting Edge the entire set and chased the oil line left for 676 - not bad considering how l normally throw top shelf equipment in this heavy of volume. Where this ball has really shined has been in my Challenge league on 3.5/1 37' Broadway. Broadway is a high volume med/short pattern that plays with some clean backend boards around 5-6-7 and some hold if you play a little swing around the straight players. This ball has been nothing but a monster giving me 892 and 991 in my 4 game league these last 2 weeks (however I used the Kingpin Max on fresh both weeks). The Cutting Edge has carried messengers, carried the 5 into the 4-7, dug out what I expected to be flat 10's and has given me the most miss room of any ball in the bag on this pattern. I've had the perfect blend of early revs to read the help in the front part of the lane, yet a controllable enough shape down the lane to still hold pocket and even carry on marginal shots. Compared to other balls in my bag, the dull cover of the Cutting Edge Hybrid has me as deep in the oil as I would be with either my Method or Quantum Bias, albeit with an earlier roll and less motion off the dry boards. In terms of overall shape, I have really liked using this ball behind my pin down Kingpin Max or Tremendous as I can see similar down lane angles but with more length through the front of the lane. If there was a ball from years past that reminded me of the Cutting Edge Hybrid it would like a longer pinned Marauder Madness or even the Vintage Danger Zone with a slight scuff. 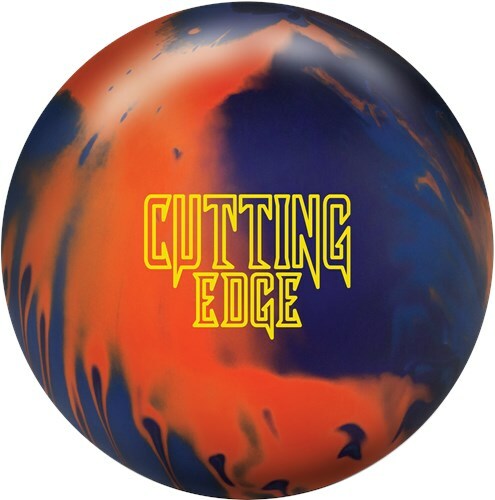 I recommend the Cutting Edge Hybrid to anybody bowling on medium-heavy oil. This ball will shine brightest for bowlers with lower tracks and on medium-shorter patterns as it rolls early and is very controllable down the lane. I also recommend the Cutting Edge Hybrid for the price. I have never seen a ball at this price point or lower that can handle this much oil and is going to be my recommendation for newer bowlers looking for that upgrade from their Rhino to handle a little oil in league. Page created in 0.727 seconds with 22 queries.